I had the pleasure of enjoying a bottle of Greek white wine over the weekend that is not yet available in the US. My friends at Mani Imports gave me a bottle of this intriguing white to help celebrate my birthday. I only shared it with a few of my guests who I knew would truly enjoy its rarity. And boy did we! Some quick background: The wine comes from Domain Foundi (foon-thee) located in the winegrowing region of Naoussa, which is situated in northernwestern Greece. This region is known solely for the cultivation of the Xinomavro (ksee-no’-ma-vro) grape. Xinomavro thrives on the cooler climate, higher elevations and the heavy clay to sandy soils of the region. 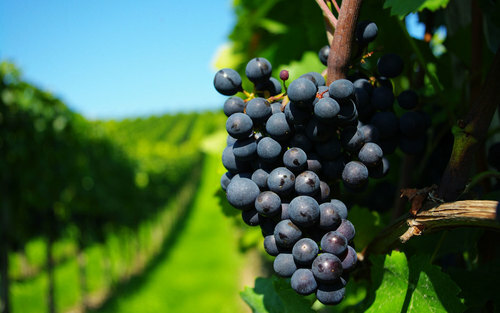 Similar to traditional Pinot Noir and Nebbiolo, Xinomavro can be difficult to grow due to its sensitivity to its environment, i.e., it reacts very differently to different terroirs, of which there are many in northern Greece. These growers have their work cut out for them! In the bottle, the wine is well-structured, dense and vibrant, juicy acidity with typically a deep red color, thus, the name Xinomavro, which in Greek literally means “acid black”. Sounds yummy, right? Many producers in this region continuously experiment with this grape – cloning, planting orientation, soil composition, trellising, blending, ageing, etc. Foundi experiments with 6 different types of Xinomavro: single vineyard, vineyard blend, varietal blend, rose, and two WHITE Xinomavros (stainless steel and barrel fermented)! Their stainless steel fermented white Xinomavro, Lefkos Foundi, was the wine I had this weekend and it was outstanding, and again is not yet available in the US. Tasting Notes: Extreme care during pressing and fermentation at low temperatures helped to preserve the initial aromas of lemon zest, fresh herbs and white flowers. Fresh minerality and grapefruit exuded on the palate. This was a very concentrated and structured wine with white wine tannins followed by a cleansing acidity and an intriguing and complex long finish. 91 points. As soon as this wine enters distribution, I’ll be sure to let you know. In the meantime, your tongues will have to continue to drool. Dr. Liz Thach, MW Distinguished Professor of Wine & Management Sonoma State University 1801 E. Cotati Blvd., Office 2026G Rohnert Park, CA 94928 USA Cell: 707.792.2002 Email: Liz@lizthach.com or Liz.Thach@sonoma.edu Website: http://www.lizthach.wordpress.com Office Hours for Fall 2015: Tues 6:30 – 7pm; Wed. 2 – 4pm & by appt. This entry was posted on August 27, 2015 by Lisa Stavropoulos in Uncategorized.